Sometimes the best eating opportunities are too much for a table for two. That’s why you need to assemble the wolf pack and prepare to tackle these 10 dinners that require a team to take down. Many involve finishing off a whole animal (primal! ), and all are perfect for hibernation season. Momofuku is still Windexing the nose prints off their windows from the opening hysteria. People were that excited for ramen. 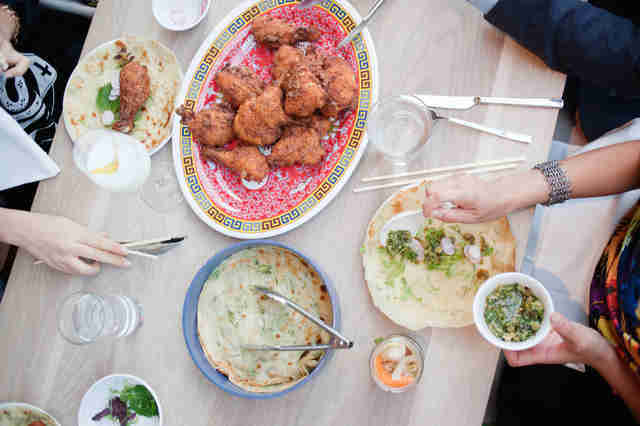 But there’s something from the David Chang empire that’s even better than his bacon-brothed bliss: fried chicken. 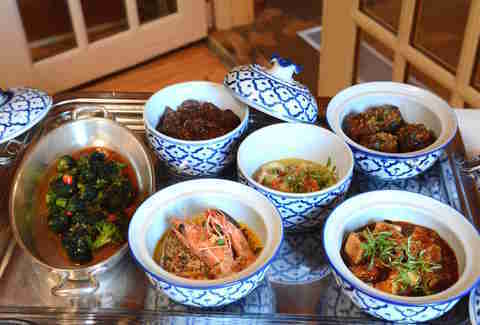 The dinners, which serve four to eight people, include two whole fried chickens -- one Southern style and the other Korean style. Moo shu pancakes will aid you in getting the fried bird to your boca, and of course it comes with an arsenal of sauces from hoisin to jalapeño garlic. Did we mention the Korean chicken is triple fried? The cost is $135 for your entire party before drinks, tax, and tip. 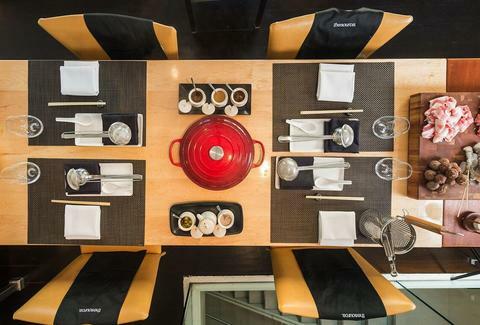 Let Scott Drewno lead your party of four through the entire food pyramid with passion during The Source’s new hot pot experience. There’s only one dedicated hot pot table in the restaurant, so it’ll take some planning ahead, like using a phone for its initial purpose. But it’s worth it, because you’ll dip Wagyu beef short ribs, meatballs, pork belly, gulf shrimp skewers, and so much more into a bone broth that’s been bubbling for 20 hours. As you cook each course, you’re deepening the flavor of the broth for the next, all culminating in a noodle course when the stock is the strongest. For God's sake, protect your Vineyard Vines and wear the bib. The meal costs $65 per person, with optional beverage pairings for a little more. Think hard about which of your friends can seriously put away some food. Hint: it’s not Rob who hits Chopt every day for lunch. You’re going to need six to eight people total to make a dent in Birch & Barley’s Beast Feast that involves three whole animals hailing from land or sea, plus a bevy of sides, a badass charcuterie platter, and an enormous dessert. As an added bonus, beer director Greg Engert will pair each course with a rare, large-format beer perfectly suited for the custom creatures you selected when making your reservation (at least 72 hours in a advance). The meal costs $95 per person, including food and drink. Ordering at a Jewish deli is almost always overwhelming because menus can be longer than the Torah. 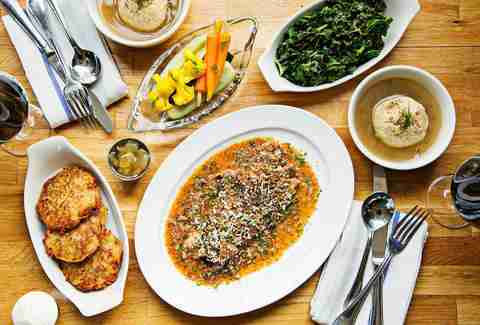 Let DGS Delicatessen make the difficult decisions for you by going with a group and taking on the family-style “Taste of the Delicatessen.” For $27 per person, they’ll fill you to the brim with pickles, matzo ball soup, braised brisket, sides, and donuts. Because donuts. Pro tip: the sides you’re drafting are potato latkes and Brussels sprouts. What started as an experiment has become an obsession at Restaurant Eve. We’re talking about Chef Cathal Armstrong’s Asian tasting menu that pulls inspiration from the Philippines, Thailand, and Korea thanks to both his Filipino wife and his world travels. 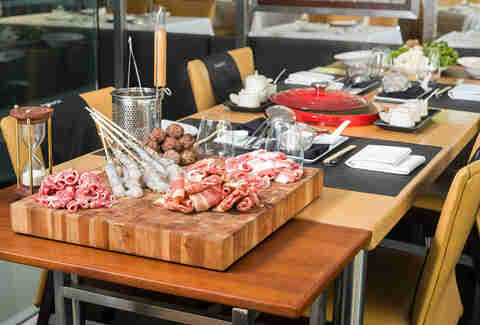 The $65 per person feast is fun, fulfilling, and features elements of both home-style and fine dining cuisines. Savor Armstrong's take on street BBQ and save room because little bowls of bliss keep coming and the whole thing is capped off with a cool dessert like a spin on halo-halo. Ready to get really intimate with a pig? Don’t worry we’ll spare you the “Call me Dave,” jokes. All you have to do is bring a group of four to six people to The Partisan, ask for the pig feast, and wait for pork products to start to arrive. The climax? 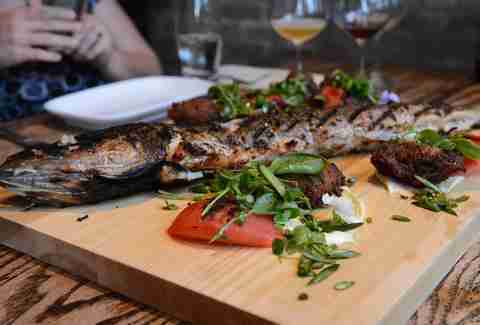 A whole roasted pig head you’ll play Hungry Hungry Hippos with. 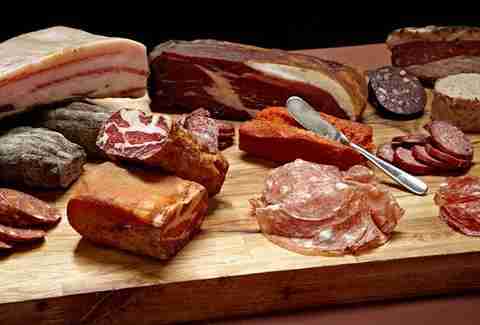 There’s also pork sausage, smoked bone marrow, and pig ear salad. The $120 feast does not require advanced notice, just tell your server you’re game. A few outside-the-norm sounds can be heard in this Ballston dining room thanks to the staff’s commitment to sticking to a Segovian tradition of breaking the crispy skin of a cochinillo pig using a plate before sending that plate crashing to the floor with a bang. Just don’t scream "Opa!" because you’ll embarrass yourself in a Spanish restaurant. The whole pig runs $272 and comes with the most fanfare, but you can also order a half ($136) or a quarter ($68). 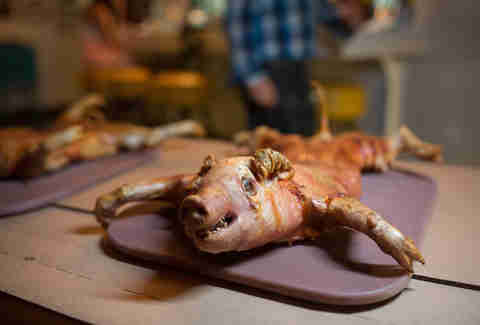 The quarter serves two to three people, so calculate that when throwing out invites to take down the whole hog. Each portion comes with piping hot Navarra potatoes to soak up the drippings. You’re bound to attract eyes in the DBGB dining room when you and your friends take your seats for the Rib to Tail dinner that feeds four to eight people. 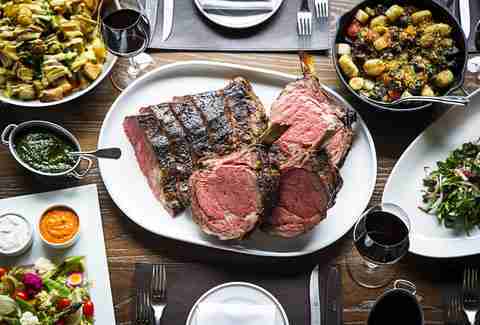 The $125 per person feast is one of the hardest to finish in the city. You’ll start with light bites like pickled and fresh vegetables before a decadent first course of snail and oxtail gnocchi arrives. Then it’s time for the main event of the evening -- roasted côte de bœuf and grilled short ribs -- served with gut busting sides like crispy duck fat patatas bravas with charred leeks and garlic aioli. You’ll finish with a light and fluffy ricotta cheesecake. The dinner is available in the main dining room, but requires 72 hours notice. You’ve heard of chicken pot pie, maybe you even subsisted on defrosted ones when you were a picky eater. Now that you’ve graduated to big time eats, try the roasted duck version of the homey dish. 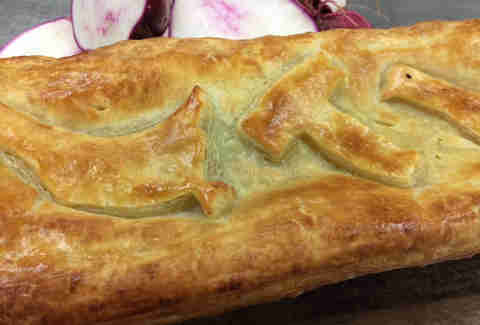 Teddy & The Bully Bar’s take weighs five pounds and includes an entire duck, plus turnips, butternut squash, and pearl onions all inside a flaky crust. The pie feeds four, costs $32, and is available every night upon request. Don’t forget to snap a pic of the duck design on the dough. New to Jackson 20 this fall are potluck dinners. 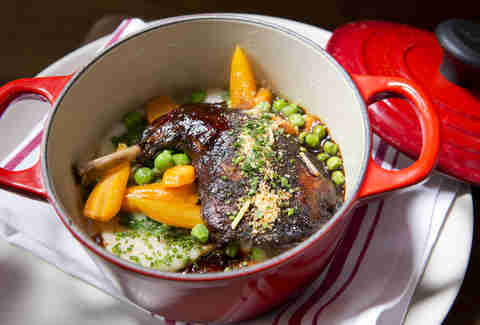 These one-pot dinner specials are served in an enormous Dutch oven and feature stick-to-your-ribs dishes like bone-in short ribs, pork shops, bouillabaisse, wild boar, and a rabbit dumpling dish dubbed pot-au-feu. Two linebackers might be able to finish it, but if you’re not on an NFL roster, order it to share among at least four people. A potluck dinner is available every night and costs $80. Laura Hayes is a DC-based food, drink & travel writer who also contributes to Washington City Paper, Food Network, Edible DC, and others. Go ahead and dare her to finish a five-pound duck pie on her own. Follow her on Twitter @BTMenu.